Poinsettias are by far the most popular of all the holiday plants. 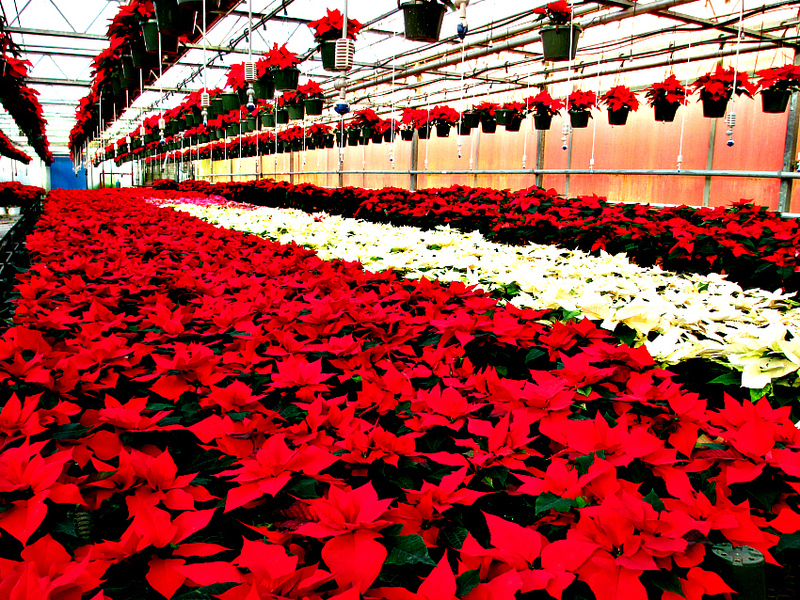 In fact, poinsettias are the #1 potted plant grown by commercial nurseries for the entire year! Do your poinsettias end up looking like this? But keeping your plants healthy and happy can be tricky because with poinsettias there's very little middle ground - they're either healthy and thriving or they're dying. 1. Poinsettias are NOT piousness. They do have a milky white sap that is bitter to taste (and stains your clothes). But you would have to eat several bushels of leaves before you got enough sap to give yourself an upset stomach. So if the children get it on their hands, (it is sticky) or on their mouth, it isn't going to hurt them. Nor will it hurt pets. 2. Poinsettias are designed to have a relatively short life span at home. They're grown as a holiday plant and keeping your plants past the holidays isn't practical because you're going to be disappointed with the results. 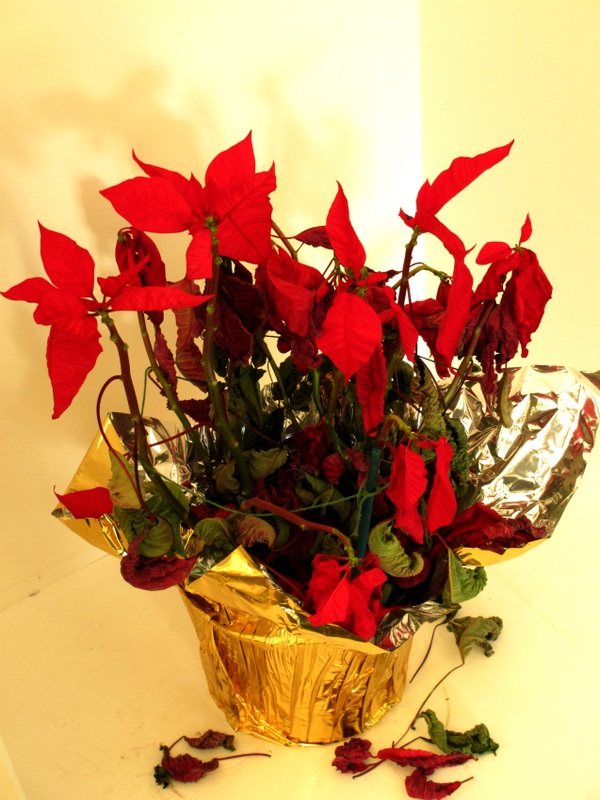 When the holidays are over, take a deep breath and send your poinsettias to the compost bin. Start over with fresh plants next year. Don't worry, there is a plant heaven! 1. Buy only "fresh" plants. The actual poinsettia flower is at the top of the plant. The brightly colored leaves that give the plant its color are called bracts. The "flowers" at the top of the plat should be just emerging and look fresh and healthy. If they're missing, the plant has either been mishandled or its past its prime and beginning to decline. 2. Skip plants that look droopy and have been sitting in plastic wrappers pulled up around their leaves. Poinsettias produce an ethylene gas that collects around the leaves and will cause the plant to drop its lower leaves without good air circulation. Plastic wrappers also make correct watering impossible. Leaves droop from lack of moisture and wilting plants rarely recover. 3. Poinsettias damage easily and suffer in the cold. Take care in getting your plants home. This is where protective wrappers are necessary. Left unprotected, poinsettias will suffer cold damage in temperatures below 45 degrees. They start dropping their leaves and n amount of love and care will stop it.